I never imagined myself sitting down to watch a show about talking trains. And yet, after having two kids, a lot has changed. My daughter might be into the Pixie Hollow Fairies, but my son is into Thomas. It started with books, slowly moving to train tables, and now has progressed to television and movies. I can't stop the obsession, and I'm not even sure I want to. Thomas and his train pals make my kids really happy in a nice relaxed way, and I've even found myself liking the crew and learning all their names despite myself. 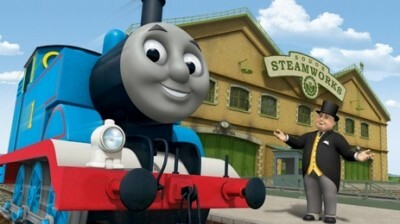 For better or worse, Thomas & Friends has become a part of my life. And now here I am reviewing a DVD collection of short tales for a grown up website, exemplifying the transfer ability that solid children's entertainment has in our world, and the lengths we will go to in order to keep our kids happy. On the imaginary island of Sodor live the trains of Sir Topham Hatt's railway. They are all Really Useful Engines, ready to put in a hard day's work to get the job down, whatever it is. The lessons they learn along the way teach them all about friendship, communication, and trying your best at whatever task comes your way. 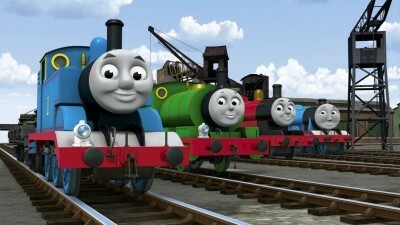 Thomas the Tank Engine may be the main character, but his friends are right behind him on every adventure. 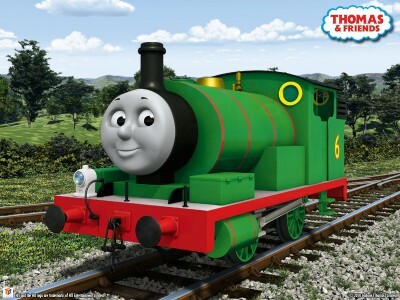 Percy, the little green engine who is full of life and loves being a great friend. James, who works hard despite his tendency for vanity. Gordon and Henry, the big strong engines who do the heavy lifting. Edward, Emily, Toby, Mavis, Salty; all the trains on the island of Sodor do their jobs with a passion that can only be admired. Their adventures create the wonderful stories that we watch, and the lessons they are taught become lessons we can all learn from as we grow, play, and live our lives one exciting moment at a time. 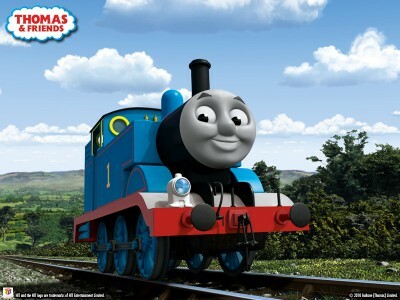 I've quickly come to love Thomas and all the other engines on the Island of Sodor. Call me sappy, but they really do have some good things to say; lessons, morals, whatever you want to call them. The stories stay positive, reminding us of the value of hard work, solid friendships, and knowing yourself. It's a series that I feel comfortable showing my kids, one that I know is imparting nothing but pleasant & useful knowledge. And I can sit down and watch it with them, which is not something you can say about every children's show. I find myself entertained right alongside my kids, enjoying the stories and characters with an abandon that is fun all by itself. Every personality of every train has a unique message and each one is delivered well, helping us to fall in love with these imaginary hunks of metal that somehow seem human. As far the movie itself is concerned, it's a fun way to spend an hour. The episodes themselves are highly entertaining and quite short, allowing for stoppage if necessary, or viewing all in one chunk. The stories aren't connected in any way other that taking place on the same island and often involving the same characters. The little breaks between segments are a nice touch, allowing for a regrouping of sorts for the kids, a chance to refocus and prepare for the next story. It's entirely animation, except for the small bit with Mr. Perkins, who is a nice addition. But otherwise, the movie is trains and their adventures. The menu allows for skipping about, so it's perfect for allowing kid to watch a little at a time, but were you to choose to watch it all at once you wouldn't find it tedious or boring, as the movie as a whole is well produced and easy to enjoy. Video: With an aspect ratio 1:78.1 (Anamorphic Widescreen), the video is very strong. The animation is sharp & clear, with a nice balance & use of color. The picture quality is high, though not a mind-blowing visual. It's simple, clean, and well-done. Audio: The DVD was done in Dolby Digital 2.0. You have your choice of languages: English, Spanish, or French. There are no options for the hearing impaired. The sound quality is fine, not amazing, with a crisp sound and nice clarity. Extras: There are three fun bonus features on the disc. One is the Roll Call Song Sing Along Music Video, the theme song set to images from The Railway Series. Next is Searching Everywhere Sing Along Music Video, an original song with footage from another Thomas movie. And lastly, Guess Who Puzzles, cut out images that slowly form themselves back into a solid picture, challenging you to guess which train character they will form. There are also five trailers: Tale of the Brave, Dinos & Discoveries, Curious George 3, Beethoven's Treasure Tail, and Team HotWheels. Recommended. Signals Crossed can't really be judged as a stand-alone film; it's a collection of short stories that all stem from the same base imaginings. 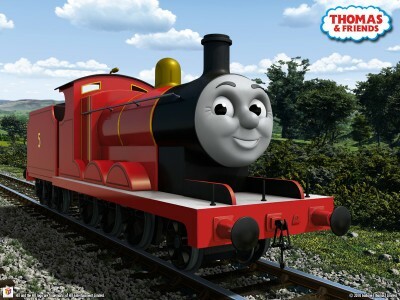 The tales are pure Thomas, so you had better enjoy his world. If this is your first experience with the Railway Series, you could do worse, and you should enjoy this lighthearted adventure series. Grab your kids, take a seat, and watch the whole movie, or break it down into episodes; both ways would work and both ways should entertain.